We are parents, families, friends, and allies uniting with lesbian, gay, bisexual, and transgender loved ones to promote support, education, and advocacy. We offer monthly community groups that provide support and education, a lending library, and opportunities for members to volunteer in the community in advocacy and outreach efforts. If you'd like to learn more about the different ways in which you can become involved with PFLAG Blue Ridge, please contact us! At PFLAG Blue Ridge, we're ready to listen. We are parents, siblings, children, grandparents and friends. Please email us and we will be happy to connect you with a board member or volunteer who can offer the support you are seeking. For LGBTQ issues of concern to youth, you may also wish to contact Side by Side (formerly ROSMY) in the Charlottesville area. 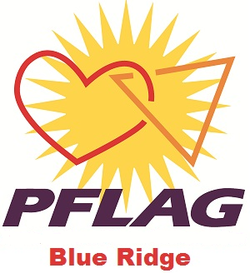 If you would like more information about PFLAG Blue Ridge, please send an email and we will be happy to talk with you!